Are you in Toronto and attending to Infocom’14? Well, you’re at the best place and time to see our live demo and presentation. It will take place at the conference venue, in room Harbour B from 13:00 – 16:00. Don’t hesitate to make lots of questions. 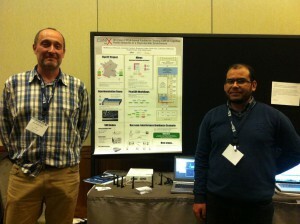 Abdelbassat and Jean-Marie will be there representing us and happy to take your doubts and suggestions. Nutaq and their representatives will also be there carrying part of the demo and presenting their equipment. Here they are in front of our demo poster.